Ez4garden Heavy Duty Work Apron is made with utility, durability, and protection in mind. Crafted from ultra-strong 600D Oxford canvas material, it is both tear and abrasion resistant. It will last through your toughest projects. It's heavy-duty but lightweight.There are some pockets,so you can put tools in it. 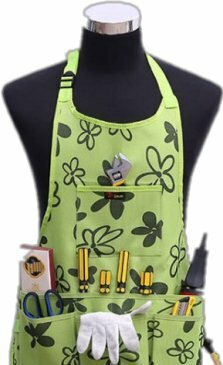 A very easy and convenient apron with 14pockets to store tools, it did not come with the tools. If you have any questions about this product by Ez4garden, contact us by completing and submitting the form below. If you are looking for a specif part number, please include it with your message.